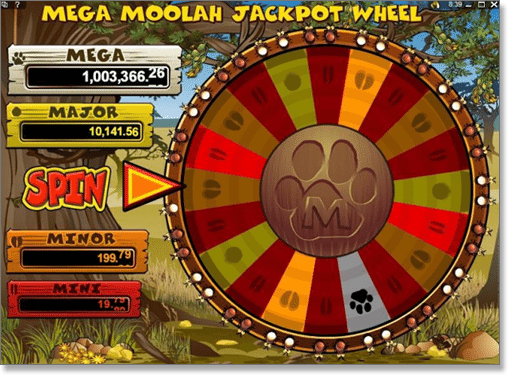 Mega Moolah is Microgaming’s most popular online progressive slot game, offering the largest jackpots available on the Internet. Wild symbol: Lion – The lion wild symbol will act as a kind of ‘joker’ – it substitutes for any regular symbol (except the monkey scatter symbol) to complete a winning pay-line, and doubles a player’s win. Scatter symbol: Monkey – Hit three, four or five monkey scatter symbols and you are rewarded with 15 free spins which can be re-triggered. All your winnings during those free spin rounds are tripled. 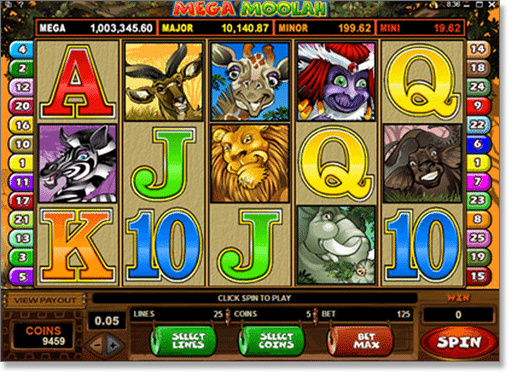 The Mega Moolah slot symbols include: the lion (wild), monkey (scatter) elephant, buffalo, giraffe, deer, zebra, and the Ace, King, Queen, Jack and 10 icons. By spinning two or more of these symbols to complete a winning pay-line, you win the following amount of coins (multiplied by your coin bet size per line). The bonus round is triggered randomly, and each of the four jackpots never go below their starting amount (once hit, they reset to their starting level). The bonus feature is a Wheel of Fortune type game with 20 slots, and there are 10 slots which cover the mini bonus, six which cover the minor, three for the major, and one for that glorious mega bonus. Note: Mega Moolah is only available for real money players (RMPs) and can’t be played in practice mode. Play the Mega Moolah pokies game on your desktop, smartphone or tablet at Royal Vegas Casino and claim up to $1200 in new player welcome bonuses.